Appliances may be among the most expensive items you’ll have to move. Take the time to prepare them for moving adequately, so they stay intact during the move. Start emptying your fridge and freezer at least a few days in advance of moving day. Dispose of or consume perishables, and empty the refrigerator completely. Clean all surface thoroughly, and leave the fridge and freezer doors open to air it out and prevent mildew and odors. Remove all interior racks and shelves and wrap them together for the move. The day of the move, you can store light items like blankets, pillows or stuffed animals inside (place them in a garbage bag first). Tape all drawers and doors shut, and wrap it for transport. Have someone qualified disconnect and cap off the gas line. Tape the oven door closed and wrap it for transport. When moving a dishwasher, the main thing is to dry it completely ahead of the move. Start a few days ahead of the move by disconnecting the hoses and drying them thoroughly. Clean the inside and leave it open for a few days to help with the drying. Start by disconnecting the washer’s water line and allowing the hoses to drain. Clean the inside and leave it open for a few days, until it dries completely. Read manufacturer’s instructions on how to secure down the drum. If you don’t have them handy, you may be able to locate them online at Appliance411.com. Also, there are washer kits available for purchase for securing the drum for transport. Clean your dryer (lint screen, surfaces) and have a professional disconnect the gas and cap off the gas line if you have a gas dryer. 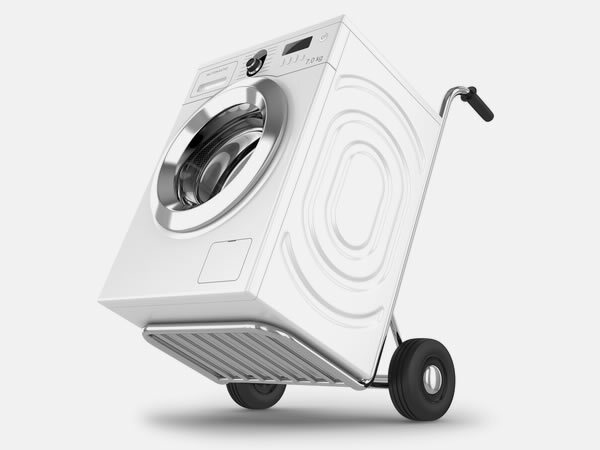 Washers and dryers are not just expensive, but also difficult to haul. Have a professional mover help secure and transport your washer and dryer. Most movers will insist that all major appliances are properly prepared before the move. That way, they can safely carry, load and deliver them to the new destination. Preparing your appliances for moving in advance will save time and none come moving day. For additional questions on how to prepare your appliance for moving, moving supplies, or moving quotes, please contact Moda Moving at (503) 678-9750.